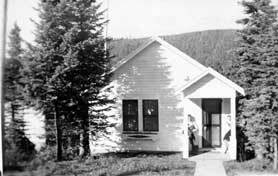 If you were to walk around Wells today, you would still recognize many of the buildings that were constructed in the 1930's to service the population of this once bustling mining town. The houses and shops still retain the charm and character created in the 1930's thanks to the hard work and dedication of the people of Wells, who have undertaken many restoration projects to preserve these unique buildings. The town of Wells was planned to reflect order and stability: certain sections of land were designated for specific purposes and even house designs were meant to reflect a mine employee's position in the company. The 'Squash House' (named so by Wellsians as it is orange and looks 'squashed') was likely rented by a common miner and the house next door (with two full stories) was likely rented or owned by a mine foreman. Most houses in Wells were built in 1934, by the Northey Construction Company, for the Wells Townsite Company, and most were rented for $18.00/month, water was separate. They look very similar because they were designed and built by the same company. 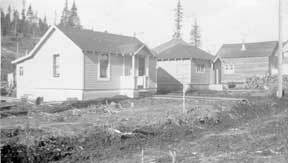 The area called 'the flats' was land set aside as subdivision for the miners and their families. Most of the houses in Wells are quite close together. 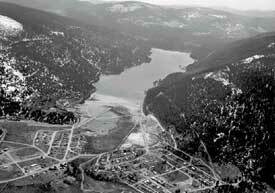 This is because the Townsite Company had only 40 acres on which to house 4500 people. Old locals tell stories about how miners who came home from drinking at the bar would walk into the wrong house because they couldn¹t tell the difference between the houses in the dark.